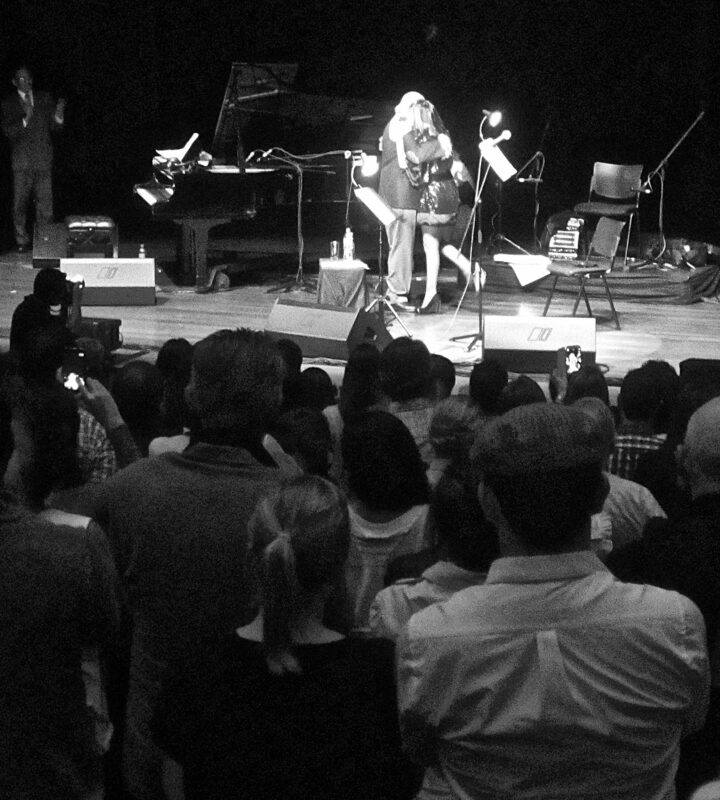 Last night, at Teatro Metropolitano in Medellín, Colombia, I heard Adriana Varela sing tango. This was no small matter. There are those who say she is the best living tango singer (among those still active), and although she recorded her first tangos in 1991, she carries the patina of an earlier era. She commands the stage as one imagines a Dietrich or a Sinatra must have done; she is half legend and half living artist. There is something in her of the pre-war cabaret, the growl in the voice and the haughtiness of the repartee, songs half-talked ricocheting into fullness. And the decadence too. The rings on her fingers flash like summer lightning, and she bats away heat with a pitch-black, feathered fan. But hers is decay as rebirth, decadence become rejuvenation. She progressed, in her show, from the old to the new, the essence of each caught in the interstices of the other. She began mostly with the standards, if tangos can be called such, classics like “Nada,” “Por una cabeza,” “En un feca.” They were sculpted, with great care, as vignettes, starting and ending without fuss, or elaboration. Yet they had a certain roughness, for they were complete only when done, when the last shard was chipped away. In “Nada,” she attenuated the phrase “¡Cuánta nieve hay en mi alma!” as though forcing it through a sieve, and she achieved the vocal equivalent of the “corrida” in tango dance: a short quickening of the rhythm, like a rachet released and pulled back again. Nothing in her is about prettiness. Her voice doesn’t slice the air gracefully, but drills through it, to the back of the house. It’s difficult to distinguish between her intakes and outtakes of breath; she gulps down the last words of lines like a predator swallowing the last morsel of prey. Following a gorgeous instrumental interlude, she spread out from the early vignettes and mixed the recent with the historical; and she involved the audience, orchestrating singalongs, her outstretched palm halting them, when the time came, with the assurance of a sorceress. With “Con la frente marchita,” by Joaquín Sabina and Pancho Varona, she paid tribute, as she put it, “to the poets of my generation.” It is the sort of composition that floods an auditorium, catching melodies in its wake and emotions in its undertow. And she sang, near the very end, a sort of tryptich of tangos written about singers. “Malena,” Homero Manzi’s encomium for a singer of uncertain identity but matchless truth, she gasped out like something too painful to admit, or impossible to aspire to. Then, “Garganta con arena,” Cacho Castaña’s homage to the late Roberto Goyeneche; there is ground glass in the weave of this song; the plaintive rasp of Varela’s interpretation was one of the things that first drew me to the sung tango. Finally, in allusion to herself, “La gata Varela,” also by Castaña, which evokes her nickname, “La gata.” It was a bold progression, from Malena to Goyeneche to Varela. It laid claim to something – a position in history, or an aspiration fulfilled. For more on Adriana Varela, click here.